Here is the list of Free Online LaTeX Editors. These editors have ample features to create LaTeX equations, such as LaTeX symbols, Greek letters, functions, matrices, arrows and tables. LaTeX (pronounced as la-tek) is a document markup language, commonly used in scientific field for documentation. It has been developed as a tool for mathematicians & scientists to render complex mathematical equations with ease. 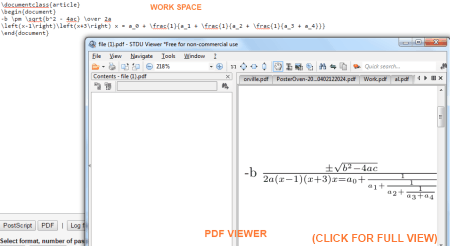 A LaTeX document can be opened in any text editor; however, it requires LaTeX editors to visualize the graphical equation. LaTeX has numerous applications, such as creating scientific papers, technical articles, resume, bibliography, journals, question papers, etc. I have tried my best to list the websites which can help you with creating your own LaTeX document. Some of these websites also guide you to work with LaTeX, even if you are a newbie. If you are interested, you can also checkout the List of Best Free Vector Graphics Editors, List of Best Free 3D Modeling Software, and List of Best Free Data Recovery Software. 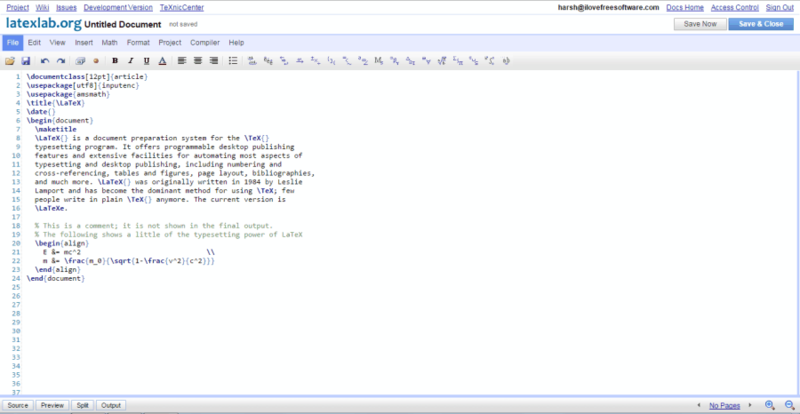 Codecogs.com renders services to the technical computing market by providing tools to furnish high end numerical codes. 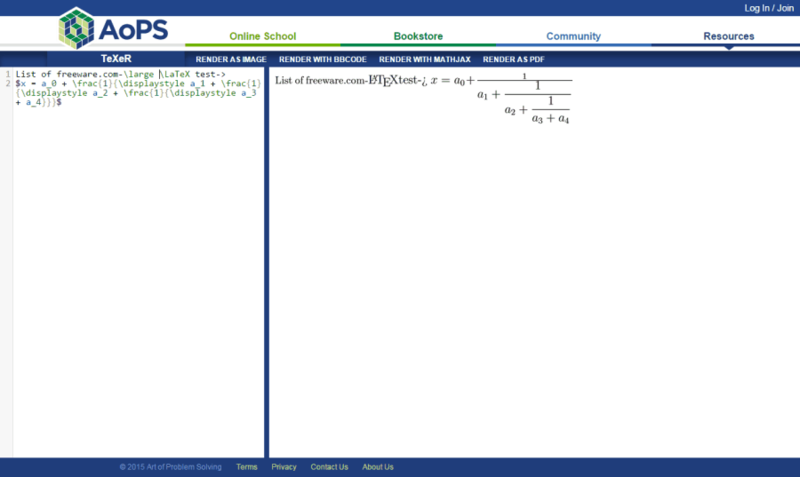 One of the tools that this website has is the LaTeX Equation Editor, which can be used to design math equations in either LaTeX or MATHML. 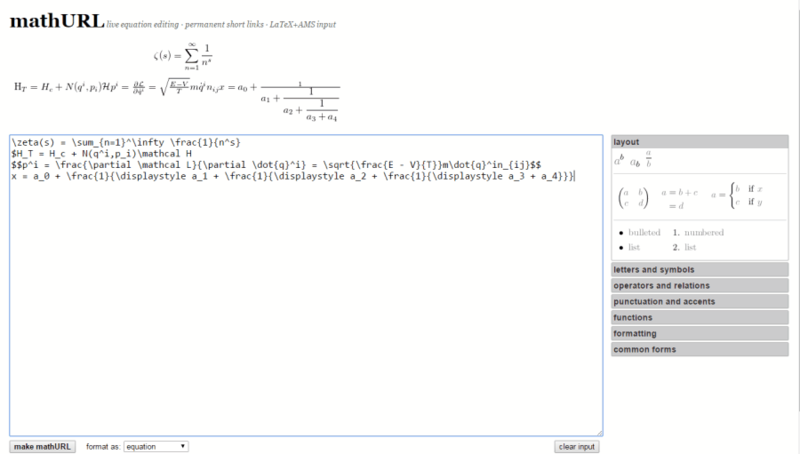 This LaTeX editor has almost all LaTeX math symbols predefined, which you might need to compile a simple or complex equation. These signs include Integration, root, summation, Greek letters, arrows and matrices. Either you can use the predefined signs, or paste/type a LaTeX equation by yourself. The output can be downloaded in formats like GIF, PDF, and PNG. You can also change the equation font, size, and color. 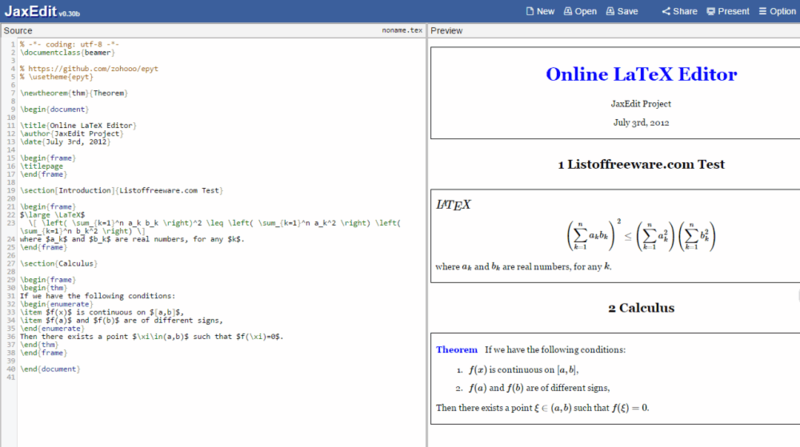 This is one of the best online LaTeX editors. This LaTeX editor has a version which can be integrated to a website, either as a Pop-up, or it can be embedded directly in a webpage. Overleaf.com is a tool for writing and publishing technical papers. 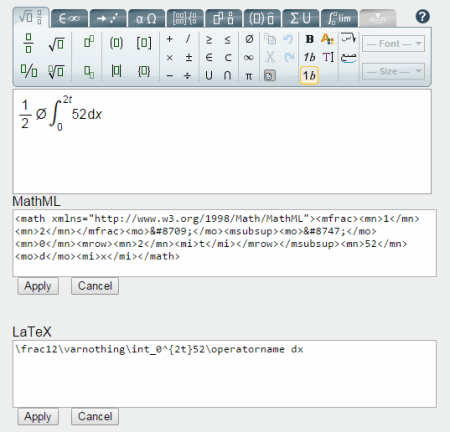 You can easily create a science paper with mathematical equations, using LaTeX. The paper is a predefined LaTeX template, which can be edited. The mathematical signs are not predefined, you have to write codes on your own. The website provides real-time preview of the work. You can download your Paper in PDF format, or your paper can be shared or published directly on this website. You can choose from a variety of LaTeX templates, depending on the type of paper you want to write. Select LaTeX templates like academic journal, bibliography, book, formal letter, newsletter, project report, etc. and start writing. Almost all the features on this website are free to use. Latexlab.org is an open source online LaTeX editor, integrated with Google Docs. Using this tool you can make your own LaTeX technical paper. 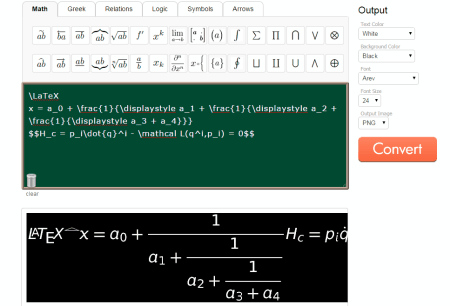 You can use from a variety of LaTeX symbols to accurately write math, and science equations. You don't need to code for changing the font attributes, as this option has been embedded with the tool. The editor is very neat and easy to use. Hit the Compile button to preview your paper, and save it as PDF. Papeeria.com is a one stop solution for creating papers, supported by LaTeX. You can create science journals, CV, technical papers, presentations, math papers very easily and include mathematical equations and LaTeX signs with the help of this extremely useful tool. There are a number of LaTeX templates to choose from. You have to manually enter codes for LaTeX math signs. This is a professional LaTeX editor, therefore you need to define the attributes while writing a paper. You can save the document in PDF format, once you have finished the compilation. The unavailability of real-time preview makes it a bit difficult to work with the utility, however you can always compile your LaTeX document for a preview and check for errors. Sciweavers.org is an academic website for science enthusiasts. This website features various technical tools and technical papers in PDF. 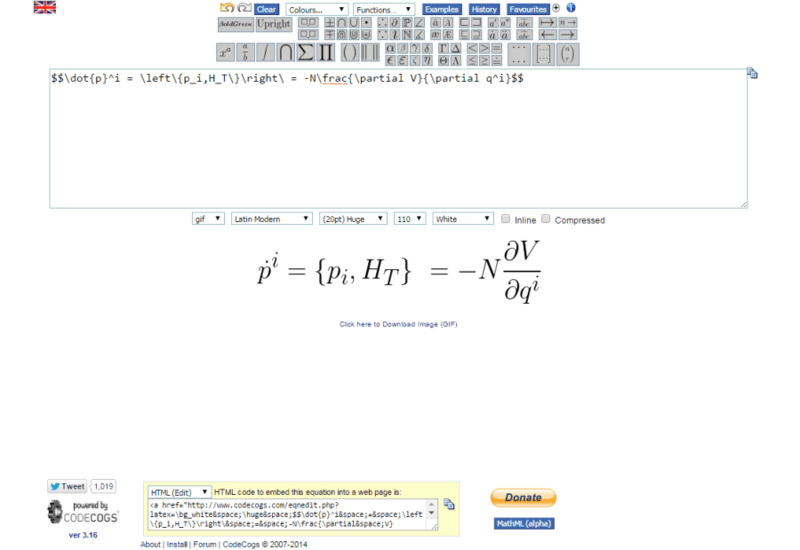 The LaTeX editor converts LaTeX equations into various formats of image, which you can embed in documents. The presence of mathematical, Greek, relational, logical, and arrow symbols makes this online tool really versatile. You can always enter your LaTeX code manually and render the output. 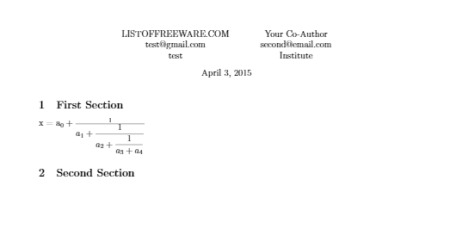 This LaTeX editor is free to use and no registration is required. 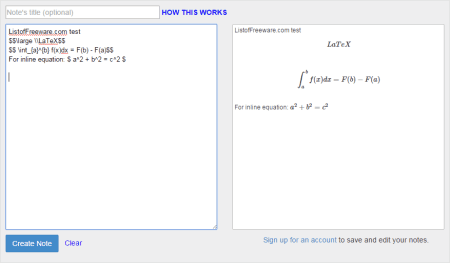 Hostmath.com is a standalone math equation editor. 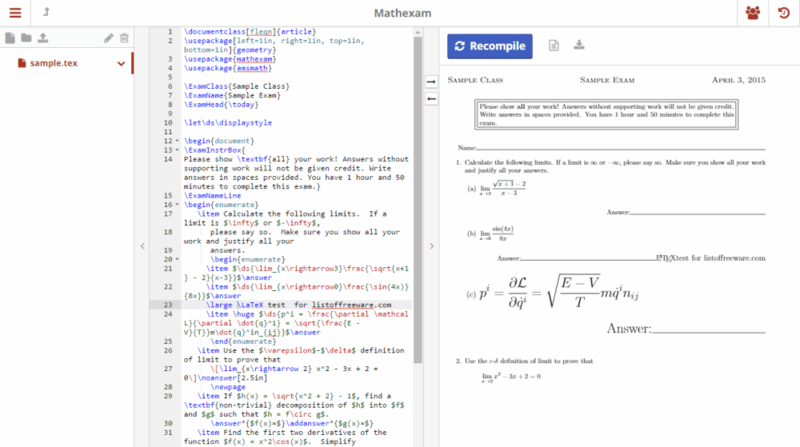 This free online tool understands LaTeX, TeX, AMSmath, and ASCIIMath; it also converts codes into equations in real time. 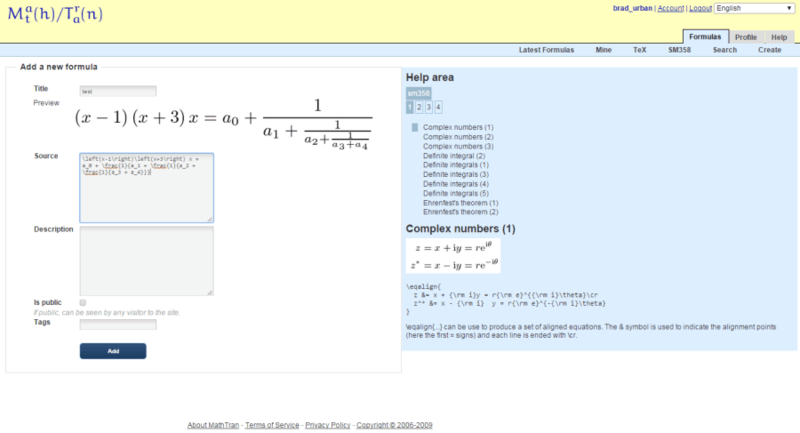 It has a collection of pre-defined LaTeX math symbols, which helps you with easily creating an equation. You can manually input codes into the editor, and get desired output on a screen just below the editor. This is a simple, yet useful LaTeX editor. At Sharelatex.com, you can create a variety of papers with LaTeX. Preloaded with numerous LaTeX templates, this is a perfect place for online LaTeX editing. 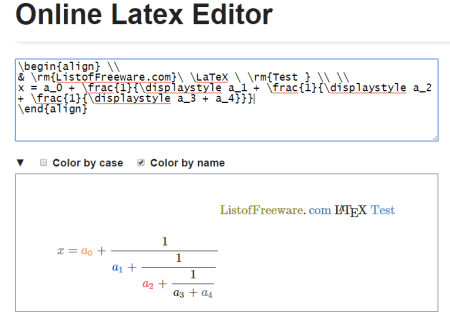 The editor lets you compile LaTeX codes, and preview it while you create the document. You can either start with a blank project, or you can choose from templates like, CV, cover letter, journal article, presentation, thesis, books, question papers, etc. You can download your project for free, once you are done with compilation. Bluelatex.org lets you create technical papers online in LaTeX format, for free. There's a variety of templates to select from; choose one, and start writing a paper. These templates are pre-coded, you just have to edit it, add a title, and your content. LaTeX symbols are unavailable, so you have to type codes by yourself. If there is any error, the compiler brings it up for you. Once you are done with adding your content, you can either hit the Compile button, or press Ctrl+S to preview your paper, and later download it in PDF format. Verbosus.com is an online LaTeX editor. 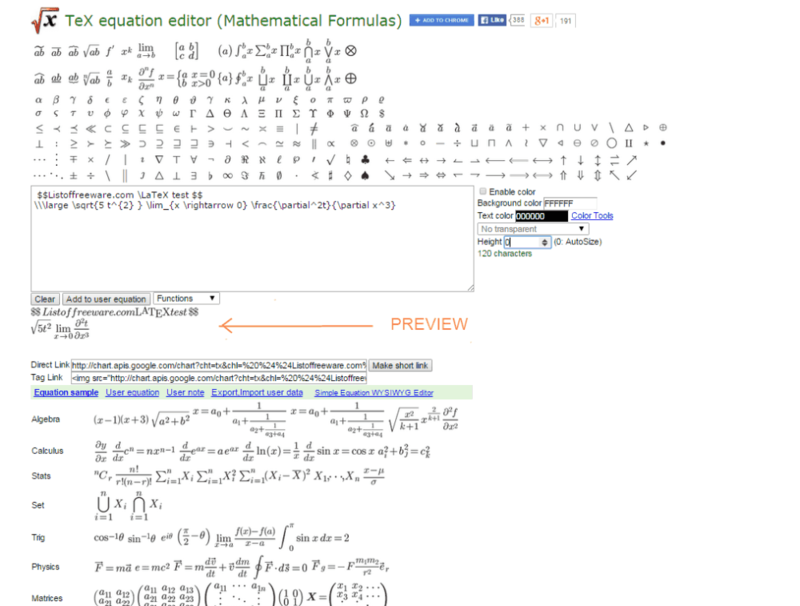 It lets you create new LaTeX projects and write codes to make scientific/technical papers using math symbols. No pre-defined codes for symbols is present, although you can write a code on your own to render equations in your paper. You can choose from pre-defined LaTeX templates to start a project. You can easily add images to your paper as well. After the compilation is completed, you can preview your document and save it in PDF format. Sagemath.com lets you write papers in four different languages, including LateX, and this website renders its services for free. You can create a new LaTeX project, and create a new document under it. 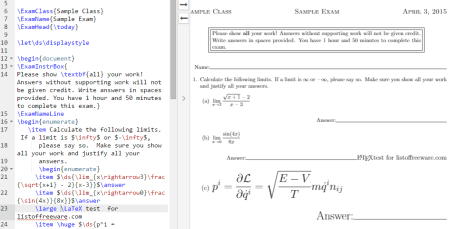 The compiler is split into two screens: on the left side lies the workspace, where you can write your codes, and on the other side you can preview your LaTeX document. The editor does not have defined LaTeX codes for symbols, but has a tool to detect bugs and issues in codes. View the document as you compile it, and save it in PDF to print, or share. 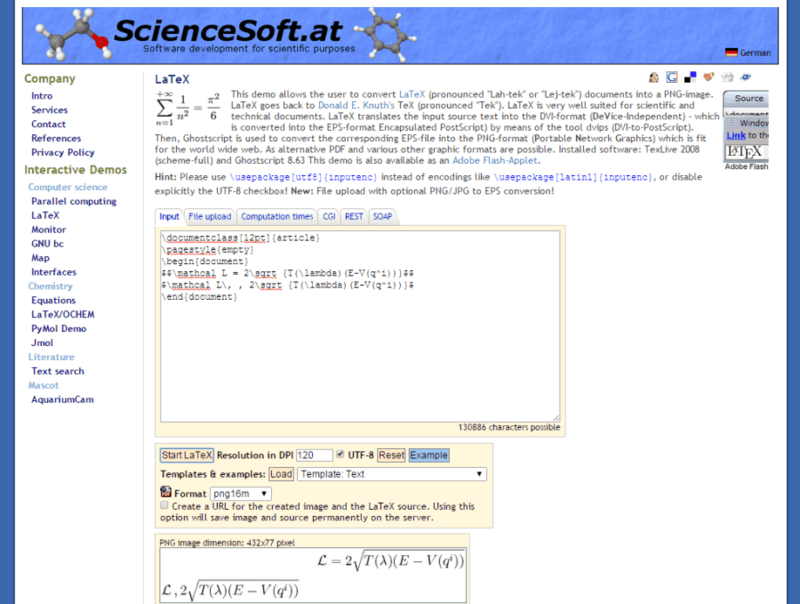 The LaTeX editor at Sciencesoft.at helps you convert LaTeX codes to images. 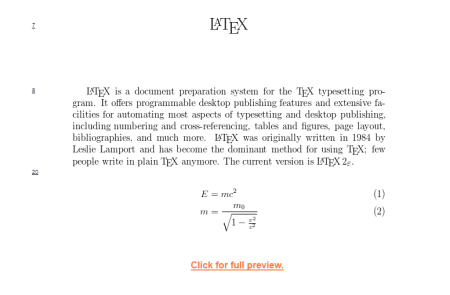 Either type, or paste the LaTeX code into the editor, click on "Start LaTeX" button, and you will get an image file with the Scientific equation on it. You can also manipulate the DPI of the output image, and calculate the total time taken by the compiler to process data. 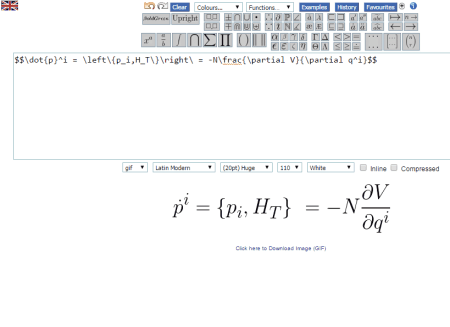 This LaTeX editor also provides you a direct link to the CGI of the equation rendered. Tex.mendelu.cz lets you create a TeX/LaTeX document via web browser. Here, you can type the source code for your technical document, for free. This is a very simple website, and it carries only few options on the interface. A real-time preview of the document is unavailable. You can press "Post Preview" to preview your document, and press "PDF" to view & save your document. You can switch between TeX/LaTeX language, and you also get an option for a compressed output of the document. 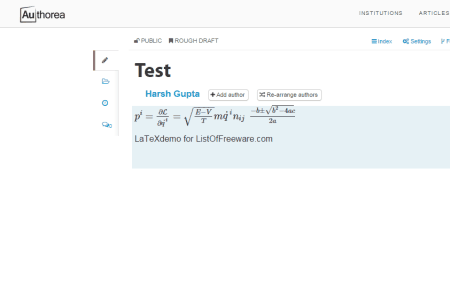 Mathurl.com has the simplest interface among online LaTeX editors that I tested, and the has the best feature set as well. You can view the output just above the workspace in real time. 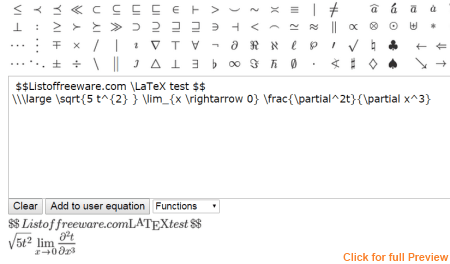 You can select from an array of LaTeX symbols, layout, operators, functions, etc. to render almost all kind of math, or science equations. 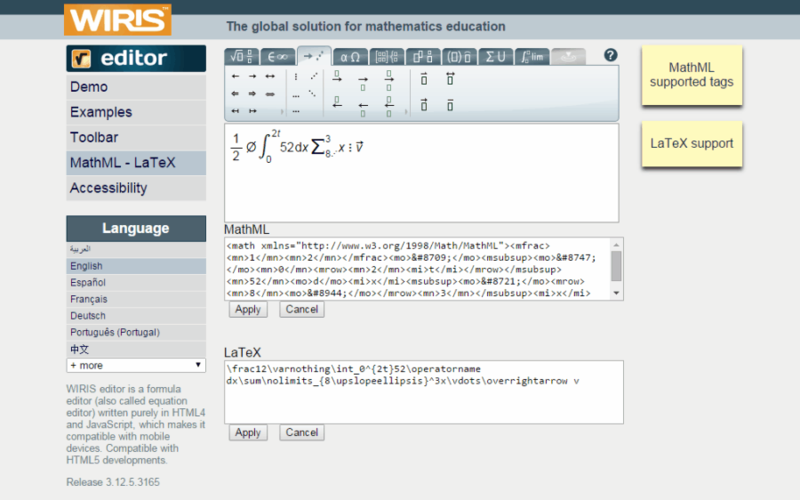 Its really simple and easy to work with this free online LaTeX editor, and create a LaTeX equation. After rendering your equation, you can save the output to your device as an image file. Mathtran.com is another free online LaTeX editor where you can render a LaTeX math formula as an image. You need to sign-up to use this free tool. 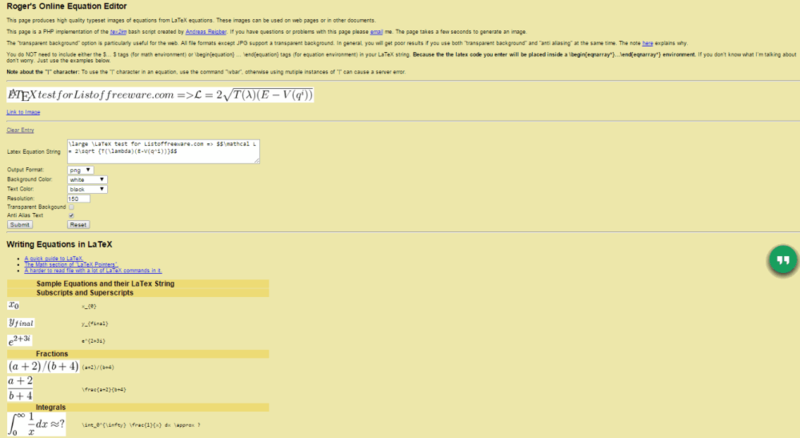 You can search for an equation created by users, or make your own equation, and store it on the website. To render an equation, click on "Create new formula" on the homepage, or you can browse through the list of newly created equations & formulas. The compiler screen also has a list of popular LaTeX equations with their source code embedded, so that you can copy & modify them according to your need. Rogercortesi.com hosts an online LaTeX edior which is free to use. 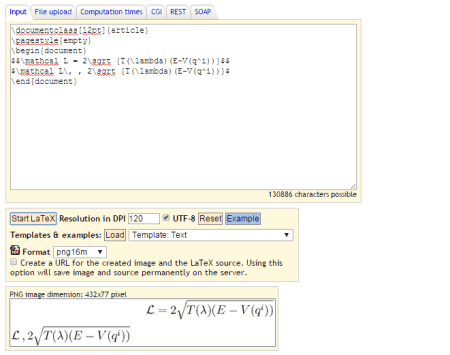 The webpage generates high quality image rendering from LaTeX equations. Type in the equation in the given space, select the output format, text & background format, resolution and press submit to render the LaTeX equation. You can easily save the image file, or use the direct URL. This tool also supports transparent background option to use the image on the Web. This is a basic & simple to use LaTeX editor. You can also find few examples at the bottom of the webpage. 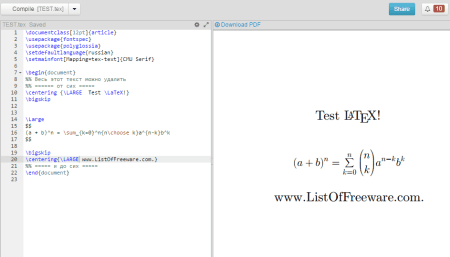 Formulasheet.com is a capable LaTeX editor. It has a huge collection of LaTeX math symbols, such as Greek symbols, relations, arrows, matix, spaces, trigonometric signs, etc. The pre-loaded mathematical signs makes coding an easy job. You can render your LaTeX formula as an image, PDF or, .tex file, change the font size, alter text color, resolution of image, and change the background color of the image. 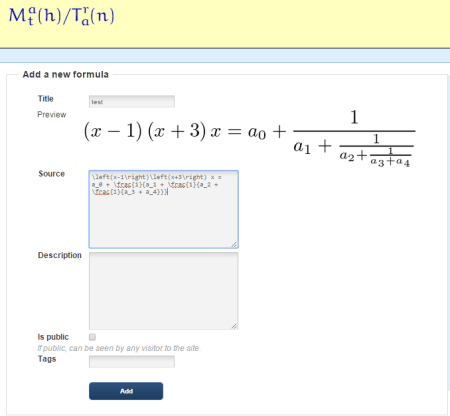 Either upload, and share the formula/equation that you have created, or browse through the list of rendered equations, uploaded by different users. 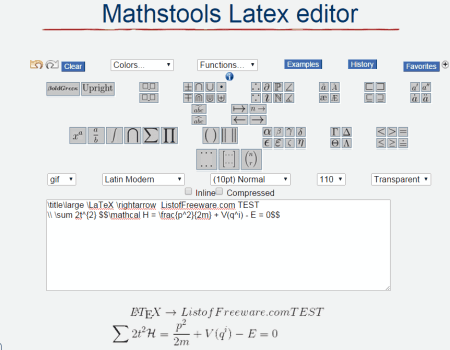 Numberempire.com hosts a long list of high-end mathematical tools; one of them is LaTeX Online Editor. 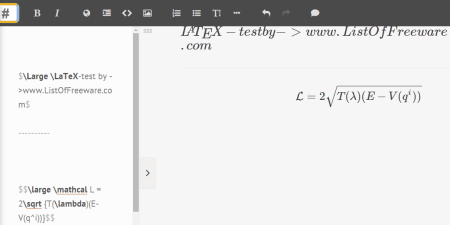 Its an elementary editor where you can render LaTeX equation in the form of images. There's an array of pre-loaded LaTeX codes. 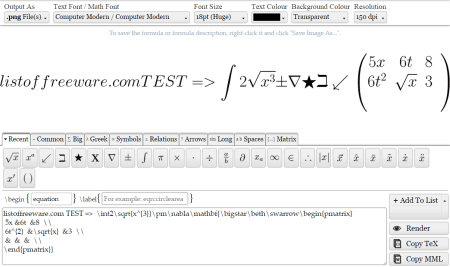 Select codes to write an equation, and render it in Font attributes of your choice. You can either save the image file, or use the direct image URL to share the equation rendering. Arachnoid.com is a website which publishes scientific, and technical material; it also provides few technical tools which might come in handy. 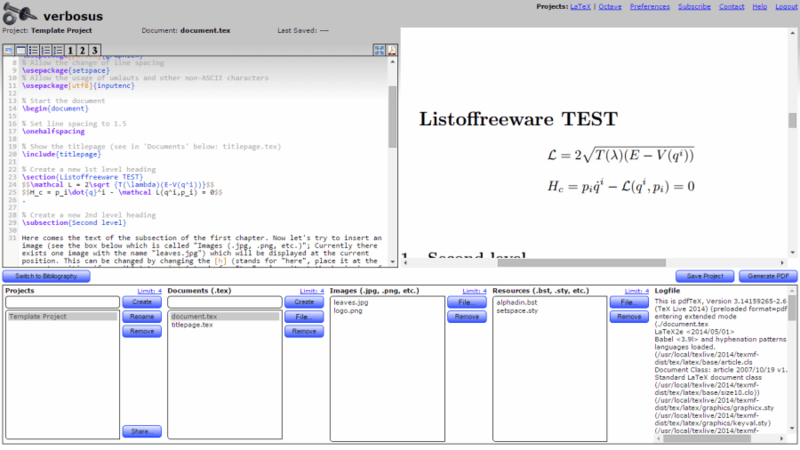 One of the tools is the LaTeX editor. The free online editor has some preloaded LaTeX symbols & Greek letters. You can also select equation templates from "LaTeX examples". This editor renders the equation in 3 different types; you can either select one of the modes, or all modes at a time to render a LaTeX equation. Save the equation as an image after the rendering is complete. Jaxedit.com lets you create a project paper in PDF format, and is supported by LaTeX. 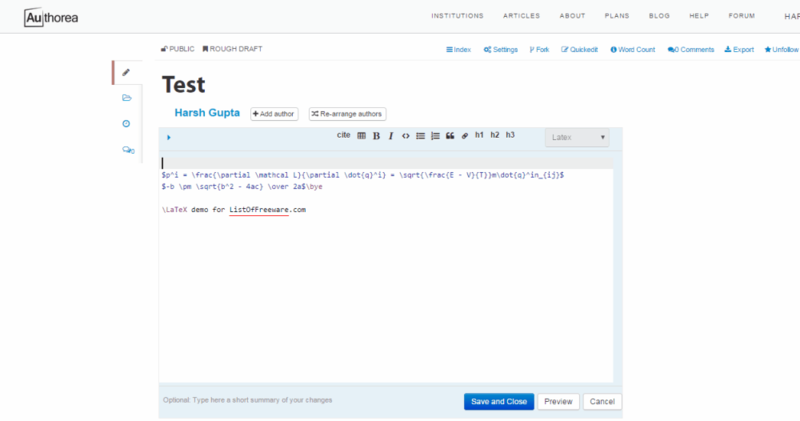 The editor layout is simple; the workspace is located on the left side of the screen where you can write a source code, while the preview page is placed on the right side. The preview is a real time application, and renders output as you type. After finishing the coding, save the document to your device, or upload it to cloud drive. The editor is free to use, and you can create unlimited LaTeX documents. Artofproblemsolving.com is an educational website, where you can get various study materials and courses. 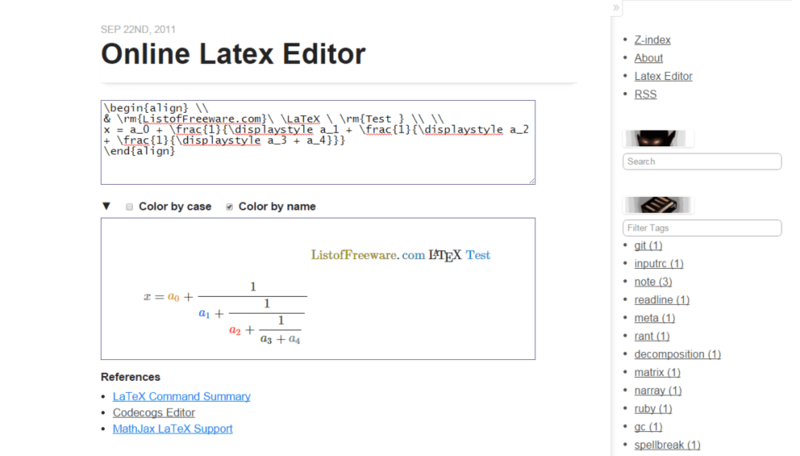 The LaTeX editor embedded to this website works exceptionally well. 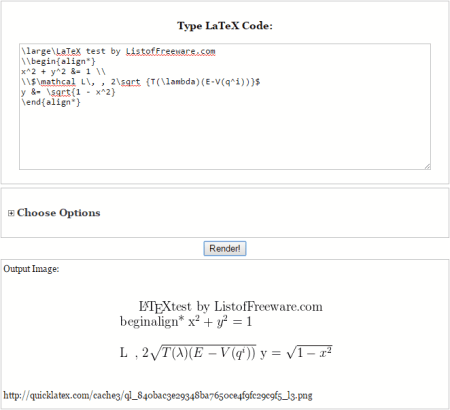 Type your article's LaTeX code in the workspace, and render it as an Image, PDF, BBcode, or MathJax formats. The editor warns you if there's any error in your LaTeX code. The tool is very neat and easy to use. Stackedit.io is an amazing online LaTeX editor. It lets you create a technical paper easily, and its full with options to make your task easy. The welcome page of the editor is a set of instructions to use LaTeX, with examples. 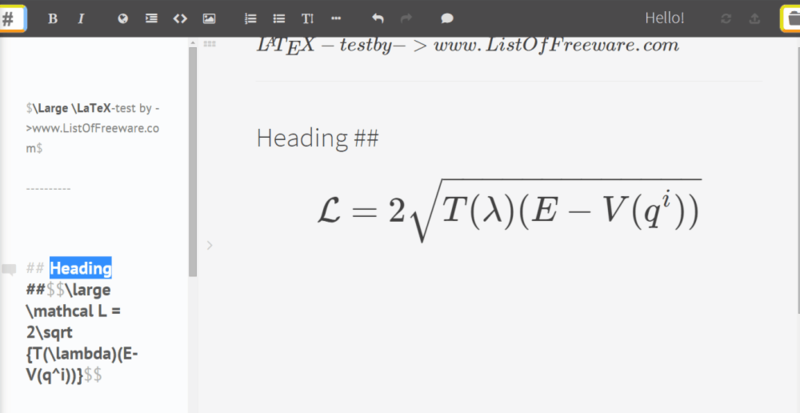 The preview window is right next to the workspace, where you can view the rendering of your LaTeX equations in real time. This editor has different options, such as font editing, bullets, insert picture, block quote, etc. You can publish, share, upload, import and save a LaTeX document easily from this website. 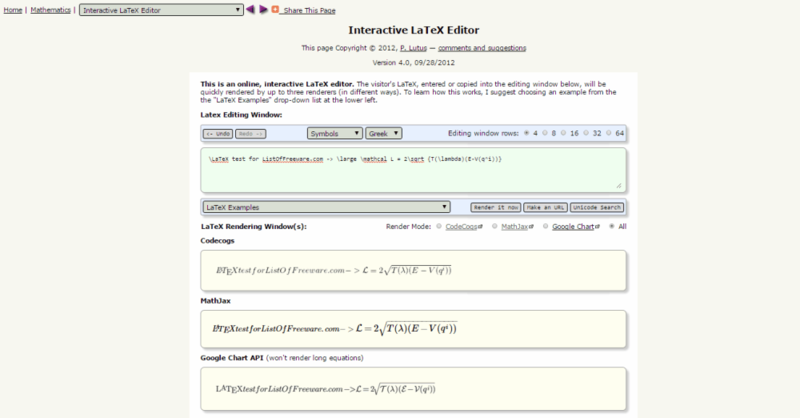 The interface is user friendly, and its an added advantage to this online LaTeX editor. Wiris.com is an educational website, where you can find study materials, and assessment test options. 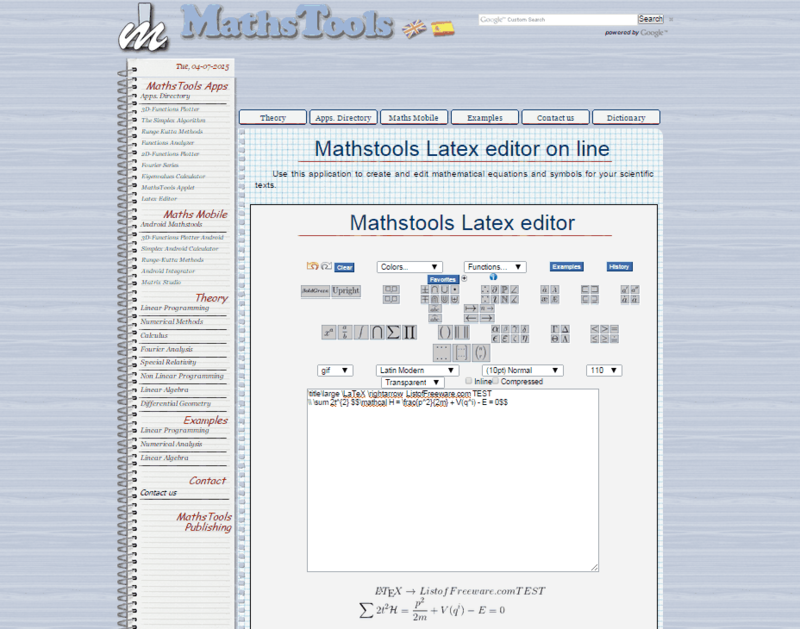 The LaTeX editor is embedded with MathML editor on this website. 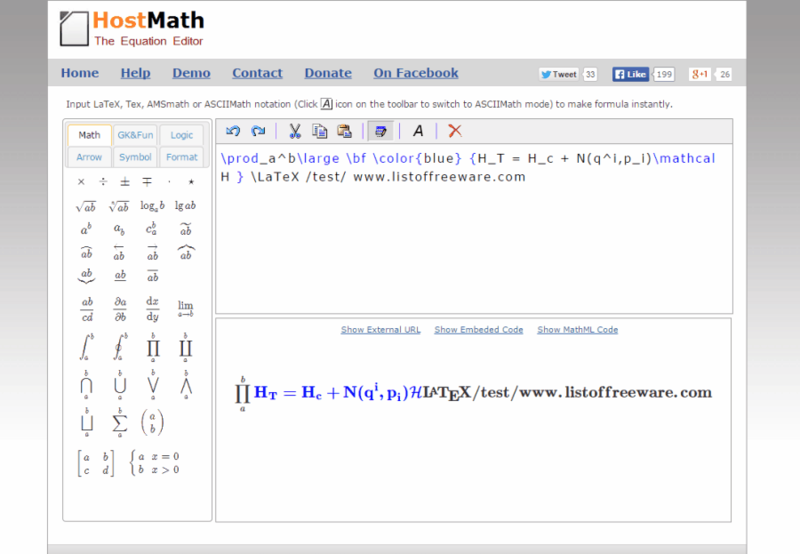 Select LaTeX symbols and functions from a range of pre-loaded templates, and enter your value. 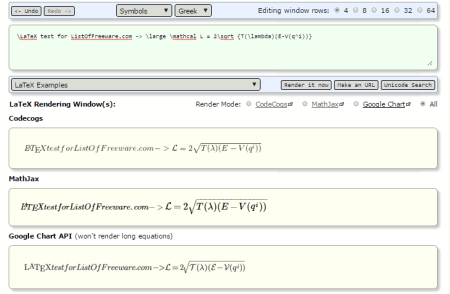 The windows will render the equations, and their respective LaTeX, and MathML codes. Copy the codes, or save the equation in an image format; this tool is really simple to use. Mathstools.com houses a number of mathematical tools, to help students and professionals solve complex mathematical equations. 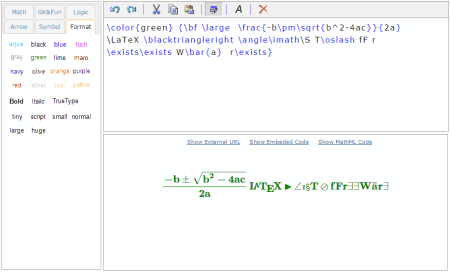 The LaTeX tool is one of them, which lets you write LaTeX equations, and render them as image. There are plenty of symbols, formulas, and mathematical relations to select from. This LaTeX editor provides a live preview of the rendering. Image attributes can be changed as well. After the rendering is completed, you can download the image to your device. 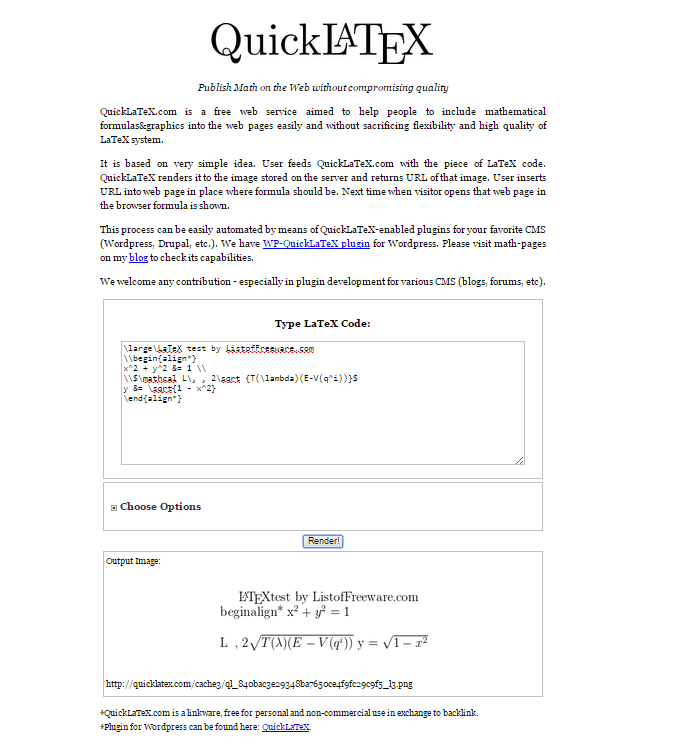 Quicklatex.com is another website which renders LaTeX equations as images. You can easily render mathematical formulas, equations, relations, and signs. The interface is neat, with an input space, few customization settings, and the output window. Type the LaTeX code, chose the font color, size, and background color, then click the render button. 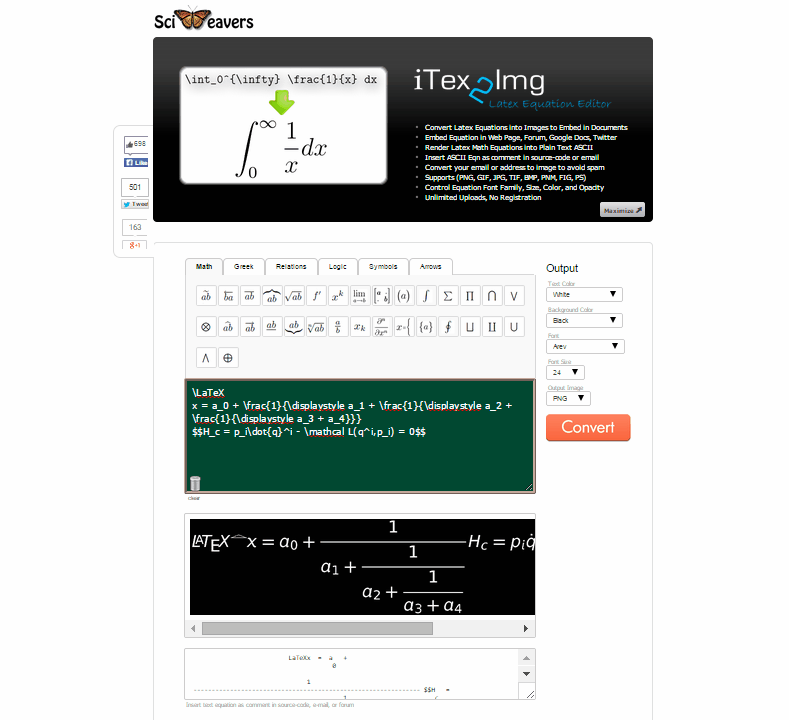 Save the rendered LaTeX equations to your device. This free online tool renders high quality image files. 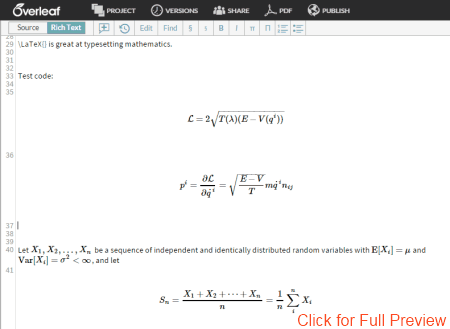 Texpaste.com is another online LaTeX editor that helps you create LaTeX math formulas and equations easily. There are coded contents such as LaTeX symbols, functions, relations, sets, matrices, and tables, which can be used directly with the editor. LaTeX equation is rendered in the output box as you type the code in the workspace. You can also save your document after a free sign-up. 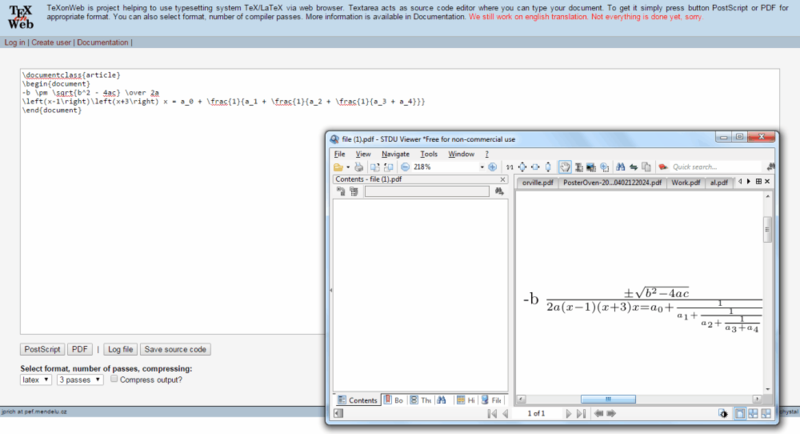 Copy the link of the rendered equation to share it, or copy the equation as MathML. 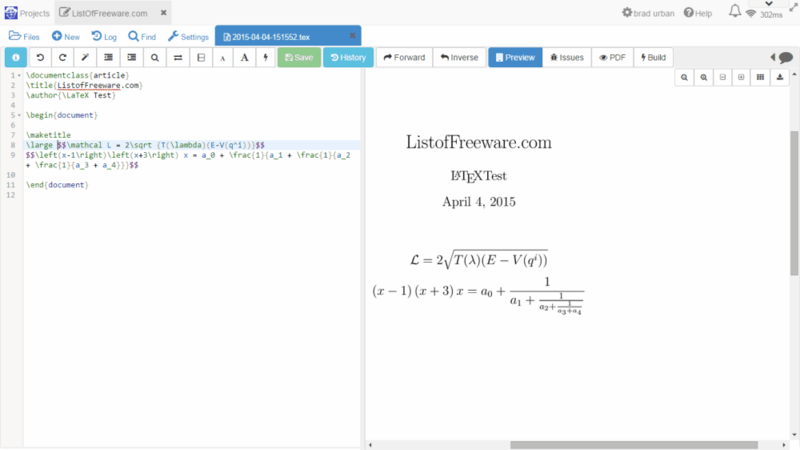 Luikore.github.io offers a free online LaTeX editor. This tool is pretty simple and responsive. Type in the LaTeX code in the workspace, and the equation is rendered simultaneously in the output box. There is a link to LaTeX command just below the tool. The output can be saved as an image, or you can save the equation in MathML language. 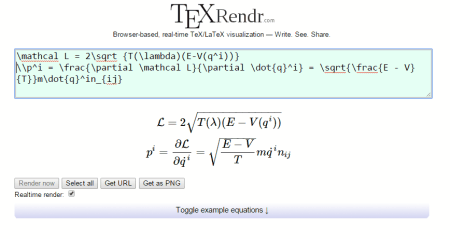 Texrendr.com is another browser based free utility to render TeX/LaTeX equations. 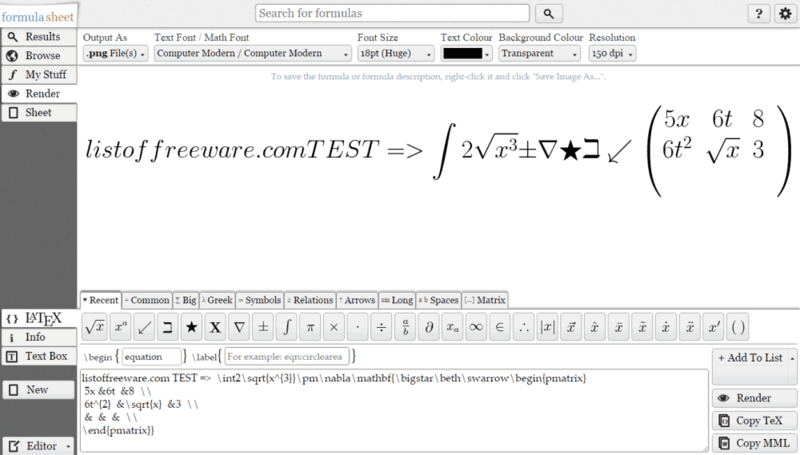 Type the source code for your Math equation, and the editor will render an output right below the workspace. Either you can share your LaTeX equation by Direct URL to the image file, or you can download the image file to your device. You can also toggle between examples to learn more about this editor. Atomurl.net hosts a simple, yet powerful LaTeX editor. Plenty of math and Greek symbols are available on this website, which you can add directly to your equation. You can also select from a number of LaTeX functions and relations. 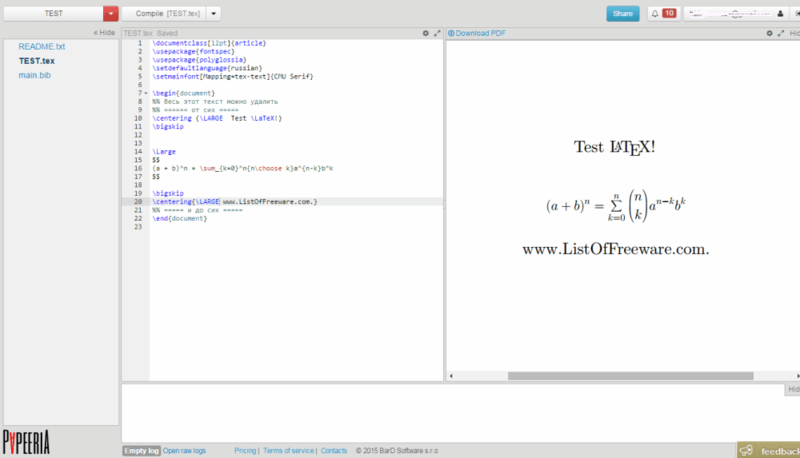 Real time preview of the LaTeX equation makes it easy to compile a code. The rendered output is in image format; font color, background color, and background transparency can be changed as well. Save the image to your device, or copy the URL to directly access it over internet. Sciencesoft.at develops software for scientific purposes. This website has two versions of LaTeX editor; one is a regular web based LaTeX editor, while another one is a Flash based online LaTeX editor. Both editors share the same functionality. You have to type the code for your equation in the workspace, select the output format of the picture, and click "Start LaTeX". Your equation will be rendered in a small window, in the case of flash based editor. 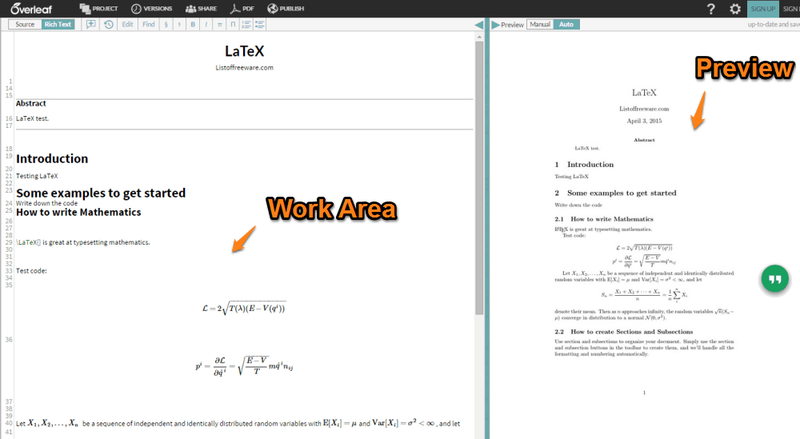 The web based editor renders the LaTeX equation just below the workspace.